If you are looking for the best cordless circular saw on the market you have come to the right place. If you are after an overall look, please head over to our Circular Saw Review here. We have reviewed a number of these great cordless circular saw tools that are smaller and less noisy than the one that operates with a cord and are the ideal cordless circular saw for home repairs, building shelves or cutting doors down. Our reviews of the highest rated cordless saw tools on the market for 2019 gives you an insight into their features, functions and technical specifications. We look at their power output, their speed, and control and ease of use. We examine their cutting capacity, how deep they can cut at what angles, as well as their bevel. View the Best Cordless Circular Saw for the Money, Below. How does a Cordless Circular saw Work? The Ideal Circular saw for Beginners? How well do Cordless Circular Saws Cork? How long does a Cordless Circular saw Last? Should I buy a Corded or Cordless Circular Saw? Are Cordless Circular Saws Worth It? We reviewed the types of blades these cordless circular saw tools can use and what batteries they require. In our reviews, we cover a number of different makes and models and to make things even easier for you we answer some of the most frequently asked questions about these great cordless circular saws in our buyer’s guide. Building a deck, bookcase or even kitchen cupboards and need the right saws to tackle these projects. The Dewalt DC390B 18-Volt Cordless Circular Saw is a beast of a machine being both powerful and durable and is ideal for the hard-core DIY enthusiasts. This great tool does not come with the 18-volt battery that drives it, however it uses the DC9096 18-volt XRP battery pack and DW9117 15-minute charger which is also available on Amazon for purchase. Operating at 3700 RPM these saws will offer fast rip cuts as well as cross cuts. The blade 6 ½“ is carbide tipped and has exceptional cutting capacity at 90 and 45 degrees. The motor has brushes that are replaceable and a fan-cooled motor which offers a lot of power and great durability with a high strength magnesium shoe and upper guard. The power and performance of the Dewalt DC390 is exceptional with a cutting capacity of 2 ¼” at 90 degrees and 1-5/8” at 45 degree with a 0-50 bevel. It can easily cut through any 2-by lumber and the carbide tipped blade offers twice the cutting capacity as a standard blade. Offering vibration-dampening rubber-grip handle and weighing in at a mere 6.3 pounds this is a very comfortable tool to use. See more information on DEWALT DC390B 18-Volt. One of the best saws that every DIY enthusiast needs in their toolshed. Offering exceptional power and speed as well as great comfort, it has the ability to cut through material easily at both 90 and 45 degree angles. The DEWALT Bare-Tool DC390B 18-Volt Cordless Circular Saw is a must have. Lightweight and compact these saws will cut through plywood, MDF, pegboard as well as melamine and drywall to name but a few materials you can use the Makita SH02R1 12V Cordless Circular Saw on. Compact, measuring only 12-3/8 inches long, and portable, weighing in at a mere 3.5 pounds with battery which also helps with fatigue especially on those large projects. The Makita operates with a 12V max CTX Lithium-Ion ergonomic slide-style battery which offer LED charge level indicator lights. The 12V battery drives the Makita at 1500RPM. The blade measures 3-3/8“ with a cutting depth of 1” at 90 degrees and 5/8” at 45 degree angles. The tilting base for bevel will cut from 0 – 45 degrees. Another great feature of the Makita SH02R1 is the built-in dust blower. This will keep the line of cut clear of debris to allow you to be more accurate. The ergonomic handle is rubberized with a soft grip. Changing your blade is no problem with the blade wrench that is attached to the cordless circular saw. The Makita offers safety protection in a battery protection circuit which will protect your saw from overloading, over-discharging and over-heating. See more information on Makita SH02R1 12V. The DIY enthusiast will love this the Makita SH02R1 12V Cordless Circular Saw. It is lightweight, compact and portable with a multitude of great features. Built with comfort in mind with a rubberized soft grip handle and built-in dust blower. The Makita also offers great safety protection features. Compact and easy to use the Black & Decker BDCCS20C 20V Circular Saw is a great power tool that offers great value for money. It comes as a bare tool without the battery, however it will work with any of the Black & Decker 20V Max systems. The Black & Decker has a whole host of features including bevel adjustment with detents at both 45 and 90 degrees. This feature will allow you to make angled cuts accurately. Offering a high torque motor and a very fast 5.5 inch cutting blade to enable you to make a variety of cuts smoothly and quickly. Make easy adjustments with tool-free Depth of Cut. The Black & Decker comes with a limited 2 year warranty. The Black & Decker BDCCS20C is a basic tool that offer a lot of features for its price and will get the job done with speed and accuracy. See more information on Black & Decker BDCCS20C 20V. The Black & Dekker BDCCS20C 20V Circular Saw comes as a bare tool and offers features that make it easy to use. It will cut fast and clean leaving you a smooth line. The high torque motor and tool-free Depth of Cut are just some of the great features you can expect from this well-priced power tool. The Makita is a high powered cordless circular saw offering a range of benefits that will suite both the DIY enthusiast and the professional working on sites alike. Compact and lightweight weighing in at only 7.3 pounds with its battery it is portable and will reduce operator fatigue while working on extended projects. The 18 Volt battery on this model is not included, but is available to purchase on Amazon. The motor will deliver 3700 RPM which is a very fast speed, and the heavy gauge base allows you to not only cut smoothly but also more accurately. The machined precision base also makes the Makita very durable perfect for the profession to use on site. The Best site power saw with a range of different cutting applications and at a 45 degree angle it will cut up to twice the amount of material. Another great feature is the 50 degree maximum bevel cutting capacity. See more information on Makita XSS02Z 18V LXT. A cordless circular saw that is perfect for working on site with. Lightweight, compact and highly portable with a powerful motor that puts out 3700RPM for fast and efficient cutting. Cut twice as much at a 45 degree angle and a range of cutting applications make the Makita XSS02Z 18V LXT Cordless Circular Saw of the top saws on the market for 2017. The Porter-Cable PCC660B 20V Circular Saw puts out an astonishing 4000RPM and is designed for aggressive cutting. This power tool is perfect for the professional contractor to use on site and will cut through almost anything. Lightweight and compact with a weight of only 6.5 pounds. The tool is sold without a battery but is compatible with the 20V Max System. The 6.5 inch carbide tooth blade will give you a 2-1/8 inch cutting capacity and it offers a large variety of cutting applications. The Porter-Cable accommodate non-traditional cutting applications using the beveling shoe that can pivot up to 50 degrees. Constructed from steel it is very durable and the contoured over molded handle will offer ultimate comfort when using it even for long periods on extended projects. For the price you pay for the Porter-Cable PCC660B you get a great cordless circular saw that offers a host of great features as well as a 3 year limited warranty. See more information on PORTER-CABLE PCC660B 20V. An outstanding circular saw that will cut through almost anything quickly and accurately. Comfortable and easy to use the PORTER-CABLE PCC660B 20V Saw is part of the 20V Max System from Porter-Cable and is very powerful and durable. A great buy and available on Amazon now. Looking for a lightweight cutting tool that is durable and easy to use, you found it in the Bare-Tool Milwaukee 2630-20 Circular Saw. The heavy-duty magnesium guards and on-board fuel gauge which tells you how long you have until you need to recharge, are just two of the great features on this circular saw. The motor is powerful on these saws offer 3500 RPM which will allow you to cut though even tough materials quickly. The blade can accommodate many applications such as electrical, framing, carpentry and pluming to name only a few. This 6.5 inch circular saw is designed with a soft-grip handle that offers both balance and comfort. The electronic brake is a safety feature which will stop the blade quickly. The aircraft aluminum shoe is durable and provides great accuracy in rip cuts. This is a bare saw tool so you will need to acquire the 18-Volt XC High Capacity LITHIUM-ION battery separately. A 5 year or 2000 charge warranty is included. See more information on Milwaukee 2630-20. A lightweight compact and powerful circular saw that offers electronic braking, aircraft aluminum shoe and soft grip handle to name a few of the great features. Its heavy-duty magnesium guards make Bare-Tool Milwaukee 2630-20 Circular Saw very durable and the 3500 RPM motor gives you all the power you will need. Cut with speed and ease with this unbelievably powerful Dewalt DCS391B 20V Circular Saw with 460 MWO, 5150 RPM motor and a no-load speed of 5250 RPM. This is not only a powerful circular saw but also very lightweight weighing in at a mere 2 pounds without battery, and durable with a magnesium shoe that also assists with cutting accuracy. Offering a 6.5” carbide tipped blade that will cut up to twice the material at 2 1/4“ depth at 90 degrees or 1-5/8” cut at 45 degrees and a 0-50 degree bevel capacity that will allow for a multitude of applications with aggressive bevel cuts. The over molded grip rubber grip of these saws deliver excellent balance and control as well as prevents operator fatigue. This is a bare tool and you will have to purchase the battery separately, this is also available for purchase on Amazon. Dewalt offers a 3 year limited warranty on this saw. See more information on DEWALT DCS391B 20V. 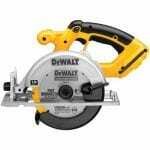 One of the most powerful of the circular saws the Dewalt offers a whopping 5120 RPM motor that will handle any cutting that needs to be done quickly and easily. Lightweight and compact with an over molded rubber grip for comfort. One of the top saws on the market for 2017. A feature packed circular saw that is perfect for the professional contractor and the DIY enthusiast alike. Powerful with a 3900 RPM with no-load, lightweight, weighing in at a mere 6.6 pounds, and compact at only 12.5” in length, the Bosch Bare-Tool CCS180B 18V Circular Saw is up to any cutting task you wish to set it. The 6.5 inch blade capacity of these saws will allow you to cut through 2 inch thick material at 90 degrees and 1-9/16” at 50 degrees easily. The blade-left design allows you to view the cut line easily for great accuracy when holding the saw in the right hand. An exclusive feature on the Bosch is the anti-snag lower guard which allows you ease into the work piece. You get an depth-of-cut gauge and bevel scale that is easy to read and a heavy-duty aluminum foot and upper guard that makes the Bosch extremely durable and great for working on the most demanding jobsites. The 50 degree bevel on these saws will allow for a wide range of applications, and changing your blade is quick and easy with the spindle lock feature. The Electronic Motor Protection or EMP and the Electronic Cell Protection or ECP prevents your Bosch from overheating or overloading. Battery sold separately. See more information on Bosch CCS180B 18V. The ultimate circular saw for the professional contractor, durable and made to endure even the harshest of worksites. Jam packed full of features to make it easy to use and accurate as well as being able to cut through 2 inch material at 90 degrees. The Bosch Bare-Tool CCS180B 18V Circular Saw is the one every professional needs. The Hitachi saw is not only one of the most powerful circular saws on the market but also one of the most feature packed. It is compatible with the Hitachi 18V Lithium Ion slide type battery which provides fade free power and is sold separately.The Hitachi is extremely easy to use with a left side blade and built-in LED spotlight provide for great vision of the cut line leading to more accurate cutting. The Hitachi is lightweight weighing in at a mere 6.2 pounds, and compact and offers a soft grip handle for great comfort. The 50 degree bevel angle will adjust to accommodate many various applications. The motor has a no-load speed of 4500 RPM and it is fan cooled to offer a longer run time. Safety features include an electric brake which also provides precision cutting, and blade guard. You get a lifetime Lithium Ion Tool Warranty from Hitachi for this saw. A great addition to any tool kit and a must have power tool for professionals. See more information on Hitachi C18DGLP4 18V. You will have to look very hard to find a saw that is so packed with features and offering as much power as the Hitachi C18DGLP4 18V Cordless Lithium-Ion Circular Saw. It is a must have tool for every professional contractor. Fast, powerful and easy to use and an exceptionally reasonable price. If you are in search of a cheap circular saw that offers great features and power then look no further than the Ryobi P508 18 Volt Cordless Circular Saw. This is a very compact powerful saw that is easy to use and can get all of your cutting projects done with ease. The front pommel handle will allow for two handed operation to give greater control and the GripZone overmold offers exceptional comfort and prevents user fatigue. The left side blade on the Ryobi Saw allows for great cut line visibility and adds to accuracy when cutting. The Ryobi offers 2-7/16 inch cut capacity to bevel cut between 0-56° degrees and has a 7-1/4″ 24 Tooth Ultra-Thin kerf carbide-tipped blade. It will cut through wood with ease with a 26% increased cut capacity. The18v brushless has a no-load speed of 3800 RPM. This lightweight 6.6 lbs saw will meet all the DIY enthusiasts cutting requirements and the nice thing is that this saw will not break the bank to purchase. See more information on Ryobi P508 18 Volt. The perfect tool for any DIY enthusiast to have in their arsenal of tools. The Ryobi P508 18 Volt brushless Circular Saw is lightweight and compact and yet packs a powerful punch. Easy to use with two handed operation and a GripZone overmold handle for comfort what’s not to like. Cordless circular saw tool is great to have in your toolbox. They are powerful and versatile and can be used anywhere and anytime as long as you have a battery charged up and ready. When considering getting a saw you need to consider a few aspects before you purchase. Some of the aspects you need to consider are how much power they offer, what features you get with the cordless saw as well as ease of use and of course safety features. We take a look at frequently asked questions by consumers when considering which of these cordless saw tools to purchase to give you a better perspective on these great cordless circular saws. This type of saw works on battery power, which means the cordless circular saw tools do not have to be plugged into a power point to operate. The powerful battery operated electric saw turns a round flat blade and this is what cuts into the wood (click here for jigsaws), metal or plastic, you will need to select the right blade for the right material or you could damage the blade if using a wood blade on metal. These types of cordless circular saw tools have handles on/off switches and an arbor nut that holds the blade in its place. They always have guards to protect the user from touching the blade as it turns. Most have height/depth and bevel adjustments, you will need to refer to your manual for your specific brand in order to see what your particular saw offers in these features. When looking at getting a saw for the beginner safety, ease of use and versatility, as well as dependability, are all aspects that your saw should have. Safety is the most important aspect, as these cordless circular saw tools are power tools and all tools can be dangerous if not handled properly or if they do not have great safety features. A saw with an electric brake that will stop the blade seconds after the power is released. The top types of these corded circulars saw tools such as the Hitachi C18DGLP4 18V Cordless Lithium-Ion Circular Saw which we reviewed for you as one of the top 10 on the market have this feature. Easy to read numbers and easily located levers and comfortable handles are also great for newbies to using these saws. If you are a beginner, you may benefit from reading this study here. This type of cordless circular saw work very well for smaller and thinner material such as plywood, and work for drywalls. Although in saying that the advent of the lithium-ion battery has transformed these 18V saws into something a lot more powerful than previous versions and some of them are genuine full-bore 6.5” beasts what can compete with their cousins. This type of cordless circular saw is fairly durable and will last a good many years if properly maintained and cleaned regularly. In saying that it would heavily depend on what you need a saw for. If you are going to be using your saw regularly and on heavy duty jobs then your lifespan will be reduced. Batteries to have a lifespan so there are many aspects that play a role in how long your saw will last. Both the corded and cordless circular saw tools are useful in their own ways. The corded saw is used to cut much thicker material and is usually a lot more powerful (click here for the full low down in this study) than the cordless saw. That is not to say one is better than the other. If you work with thick materials and are never working off site where power supply could be an issue, such as in a commercial environment, then the corded saw is preferable. Also if you are going to be working long hours with your saw there is no substitute for this version. However, if you are new to using these types of cordless circular saw tools, or only work on small projects, or often require the use of this type of saw off site, then the cordless version is better for you. The best thing about these types of saws is that you can use them anywhere and anytime and under any condition. All you do is have a battery charged and pull the trigger to get your saw going, and if your battery runs out you can replace it with a secondary battery as it recharges. Yes, they are definitely worth the buy. That being said, if you are going to be using your saw day in and day out for large jobs it would probably be better to invest in a different version. Cordless Circular Saw tools are perfect for the DIY enthusiast as they are easy to use, powerful and can be used anywhere and anytime, unlike their counterparts. Even professionals use them for their smaller jobs as they are just so much more convenient. This type of saw is fantastic for both DIY enthusiasts and general contractors to have in their toolbox. They are powerful saw tools that offer a number of great features and can get the job done quickly and efficiently even if there is no power available. Operating at 3700 RPM the Dewalt DC390B will cut through your material with ease at both 90 degrees and 45 degrees with a cutting capacity of 2 ¼ inches and 1-5/8 inches respectively. The 6.5 inch carbide tipped blade, which offers 2x the cutting capacity of standard blades as well as being durable and able to cope with heavy material. Building that deck, making kitchen cupboards or a bookcase, then the Dewalt saw is the tool you need. The fan-cooled motor and magnesium shoe upper guard makes this one of the most durable on the market along with its brushes that are replaceable. The vibration-dampening rubber-grip handle and the fact that it weighs in at a lightweight 6.3 pounds make this a very comfortable saw to use. Power, portability and ease of use, these are the three things that make the DEWALT Bare-Tool DC390B 18-Volt Cordless Circular Saw our top pick for these types of saws in 2019. As you would have read in our reviews there are many great features offered in the Makita that it is difficult to know where to start to describe how great it really is. It is not only powerful, it is lightweight at only 3.5 pounds, and compact, coming in at 12-3/8 inches in length, and easy to use. The Makita will easily cope with material such as plywood, MDF and melamine cutting through them will no difficulty at all. The 12V Battery offers 1500 RPM which is more than enough to power through any task you set it. The blade is 3-3/ inches with a cutting depth of 1 inch at 90 degrees. It offers a tilting bevel which cuts from 0-45 degrees. Extra features include a built-in dust blower which keeps your cut line clean for better accuracy, a LED charge level indicator light and a battery protection circuit to prevent overloading, over-discharging or overheating of your Makita. It also offers a blade wrench that is attached to the saw for easy change of blade. All of this and it includes both battery and charger. Great features, great power and an included battery and charger, that is what makes the Makita SH02R1 12V Cordless Circular Saw our premium choice of blades on the market in 2019. The Black & Decker saw offers a lot of features, great cutting ability and depth of cut along with enough power to get the job done. All of this and an excellent price, that is why we have selected the Black & Decker BDCCS20B 20V Circular Saw as our great value pick of out of the cordless circular saw tools that we reviewed for you on our list of top ten. Features include adjusting bevel with detents at both 45 degree and 90 degree angles. With this great feature you can make your angled cuts accurately every time. The high torque motor along with the 5.5 inch cutting blade allow you cut smoothly and quickly through your material and you can make adjustments using the tool-free Depth-of-Cut feature. Offering a two year limited warranty and although it does not come with a battery it is still great value for money and an excellent saw for the beginner to use. 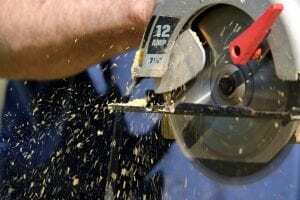 We hope you enjoyed our article on "The 10 Best Cordless Circular Saws for Home Repair & Building", if so, please share and rate it. The Makita SH02R1 12V max CXT is an excellent tool, the build quality is amazing its very powerful and lightweight and also come in a great carry case and you get two batteries in the box, very happy with this purchase.